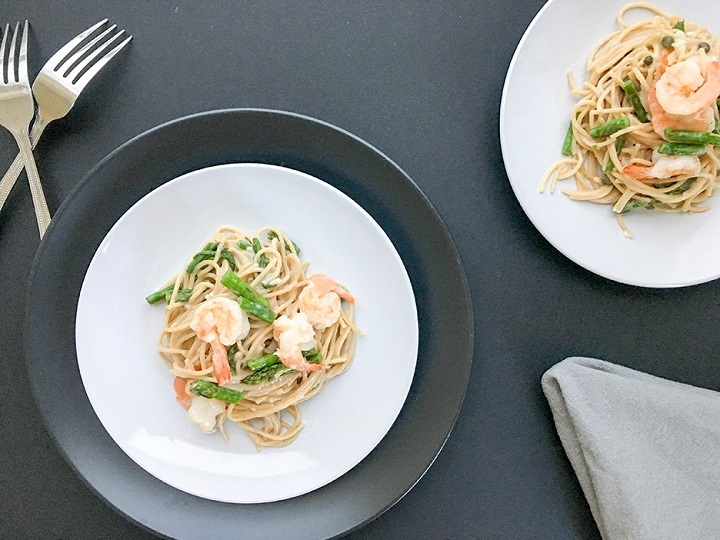 If you’re looking for an easy light recipe for a busy weeknight, you’ll love this Creamy Shrimp Asparagus Pasta dish. It has all the benefits you’ll appreciate. It’s healthy, offers an easy clean-up, and is ready in 30 minutes or less. You can’t beat that – right. I have to admit that I hadn’t planned on making this dish, but when I stopped by my local Sprouts and saw that a bag of frozen raw shrimp was on sale for $9.99 and asparagus $1.98 per pound I couldn’t resist. So, I tossed the 2 items in my cart and continued shopping for other great deals. My visit to Sprouts ended up being a great shopping day. Before starting the cooking process, I recommend that you begin boiling the water for your pasta and gather all your ingredients. After gathering the ingredients, minced the garlic, rough drop the asparagus (see note), de-vein and wash the shrimp. It wouldn’t hurt to measure out the liquid ingredients. Remember, we are creating a healthier version to a creamy sauce by adding chicken broth, milk, parmesan cheese and a little flour. Although this Creamy Shrimp Asparagus Pasta can be made in one pan, I decided to grill the shrimp and asparagus using my indoor grill. I found this process to be faster. Otherwise, you can simply saute them in the same pan that you’ll be using to prepare the dish. Similar to my White Wine Lemon Garlic Shrimp Pasta or my Skinny Creamy Sun Dried Tomato Shrimp Pasta. Grill: Lightly coat the shrimp and asparagus with olive oil and grill each for a couple of minutes on both sides. The shrimp and asparagus only requires a couple of minutes as you want to retain the perfect texture of the shrimp and crispness of the asparagus. Overcooking will result in rubbery shrimp and mushy asparagus. Boil: Boil your noodles until al dente. Sauce: This pasta dish doesn’t require any heavy cream. You make the sauce almost like a gravy but instead of heavy cream. You’ll make this velvety creamy sauce with flour, chicken broth, milk, and parmesan cheese. Finished product – Prepare the sauce in the pan. Once you have your desired consistency, add the noodles, shrimp, asparagus and toss until all ingredients are combined. 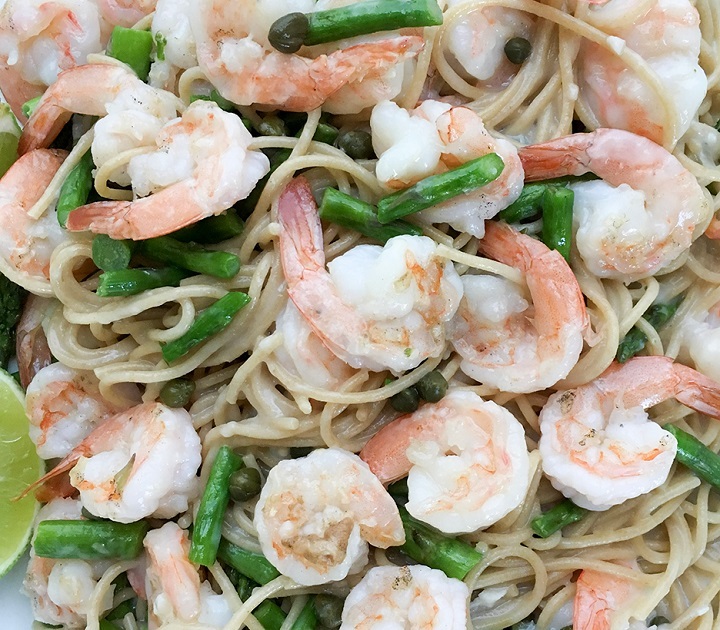 There you have it – Creamy Shrimp Asparagus Pasta. A perfect weeknight dinner. 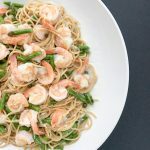 This quick and easy Creamy Shrimp Asparagus Pasta made with shrimp, asparagus, and capers in a light cream sauce is the perfect choice when your pressed for time. Succulent shrimp & crisp asparagus makes this a must have dish. Boil water for pasta and cook pasta until al dente. Drain pasta. Set aside. De-vein & wash shrimp. Pat dry with paper towel. Set aside. Wash asparagus. Pat dry with paper towel. Set aside. Drizzle olive oil over shrimp and asparagus. Season with salt. Coat grill with cooking spray over medium heat. Place shrimp and asparagus on grill and cook for 2-3 minutes on both side. Remove from grill and place on a clean plate. Set aside. Place saute pan over medium high heat. Add olive oil and saute garlic just until fragrant. Add flour and whisk for 30 seconds until flour starts to bubble. Add chicken broth, milk and season with salt. Whisk constantly until sauce is smooth and has thickened. Add more freshly grated parmesan, toss lightly and sprinkle in capers. Feel free to add chicken broth a little at a time if sauce becomes too thick.